What can you use this toolbox for? The toolbox can give you an overview of the benefits of different urban interventions, guide you towards further literature and give you examples of where an intervention has been used. It can also help you make decisions about the right way to intervene in your local environment. 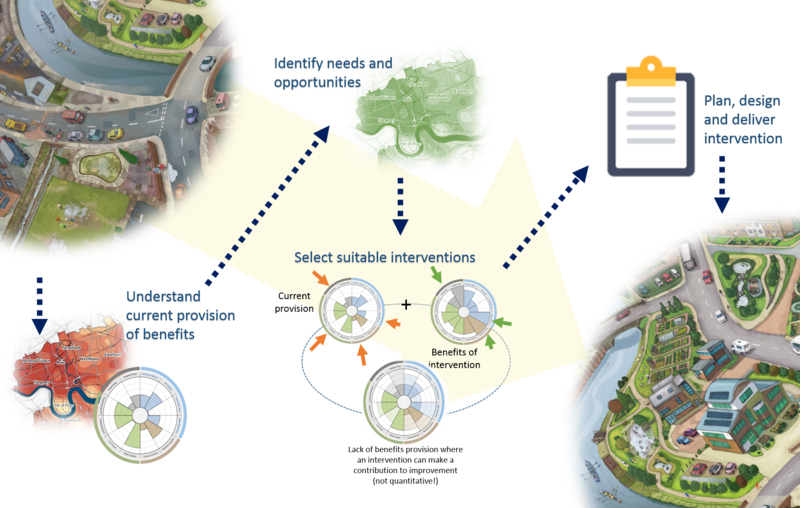 The benefits wheel shows you the relative contribution a certain type of intervention can make to a specific characteristic of an area. It identifies 12 different benefits, grouped into four categories – social, environmental, economic and cultural – that influence the quality of life. The toolbox is made up of a number of tools or “interventions”, each with different characteristics. Most of them work as actual “interventions” (for example, swales) – i.e., they are meant to be designed and developed specifically for an area to address certain issues, be it as new build or retrofit – but there are a few that are usually “existing assets” (for example, public parks) – i.e., they already exist in the urban landscape and are likely under pressure, for example from development. These two categories are of course not completely exclusive – there may be existing “interventions” in the landscape that need protection or improvement, or there may be opportunities to develop new “assets”. 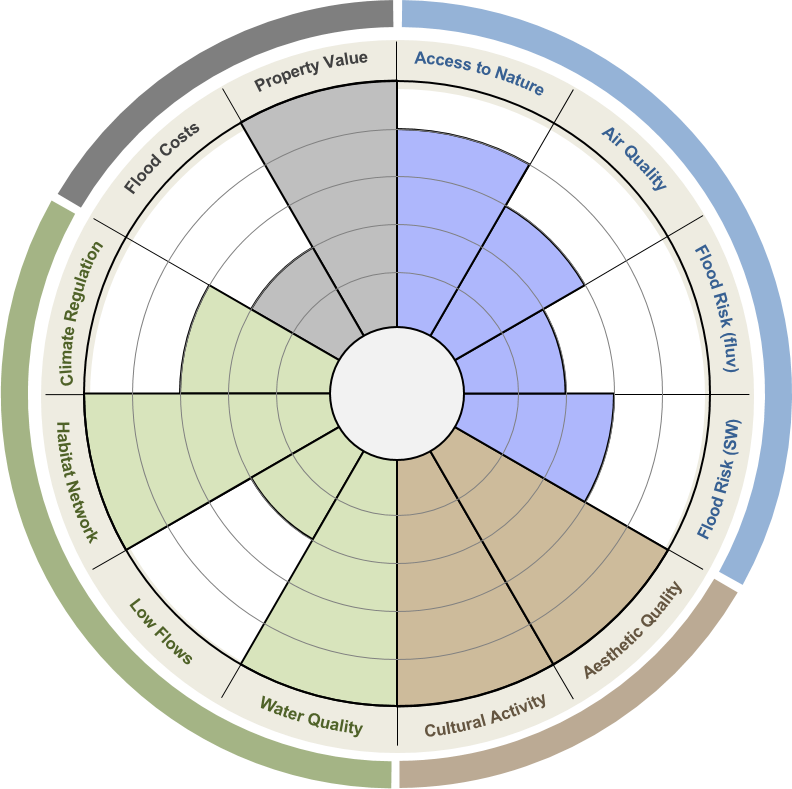 The Benefits Wheel constitutes 12 different benefit indicators that can be influenced by the intervention, grouped into four categories: social, environmental, economic and cultural. Each of the different benefit indicators is ranked on a scale from 1 to 5, indicating the impact that the intervention can have on it, compared to other interventions. For example, detention basins score a “2” on the benefit “Habitat Network”, while trees score a “4”. This means that placing trees in the urban landscape can have a greater positive impact on the development/protection of habitats and biodiversity than building a detention basin. This is a semi-quantitative ranking that does not indicate a percentage, but an indication of the relative contribution the intervention can make on the provision of a certain benefit. The ranking has been assigned on the assumption that the intervention is well planned, designed and maintained. Further information on each of the benefit indicators is given in the detailed “Benefits” section of the tool factsheet. This section gives you more detail on planning aspects of the intervention. If you know the details of where you would like to install an intervention, you can use this section to select suitable options and find further guidance. Or, if you would like to identify suitable options for installing interventions, you can find initial information on what each intervention needs to work here. More detailed guidance can be found in various guidance documents, for example the Suds Manual published by CIRIA or you can check the references of this section. Costs: indicative capital cost. This can vary due to local factors and should only be seen as an indication. Some factors influencing capital cost or in some cases lifetime costs may be given. Maintenance: Average maintenance costs per unit are given where available or an indication of magnitude of costs is given. Typical maintenance activities are indicated. Correct maintenance is crucial to guarantee that the intervention can deliver, and detailed information should be sought before it is planned and installed. Feasibility: Options of fitting intervention (retrofit or new development) are indicated along with other factors that can influence whether or not an intervention can be delivered successfully. 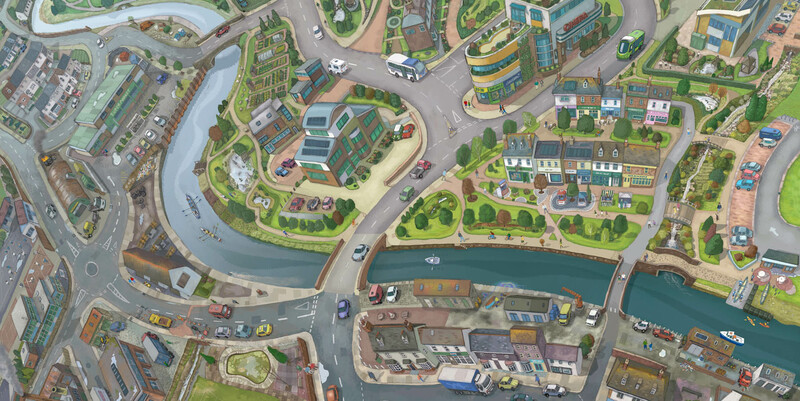 To address not only surface water flooding but most of the benefits represented in the wheel adequately, you should look at the bigger picture of what you are trying to do in your area. Look at interventions as part of the landscape and think about how you can combine them to achieve optimal outcomes. This is especially important as interventions come in different shapes and sizes and their respective relative contribution can therefore vary. This section presents examples and ideas on positioning interventions and indicates their function in dealing with surface water. This section gives information on further important benefits that can be gained from an intervention that are not included in the benefits wheel. It also lays out potential negative effects it can have. Each of the twelve wedges of the benefits wheel represents one indicator for the provision of benefits through delivering an intervention or protecting/restoring an existing asset. In the factsheets, details on how the intervention can do this are given along with their references so you can understand what it is that the intervention influences. To get a basic understanding of what the indicators mean, read the table below. Indicates contribution to reducing surface water flooding through either infiltration, conveyance or storage of runoff. Higher numbers have been assigned to interventions infiltrating runoff, since this reduces the volume of runoff from the start. Indicates potential to influence flooding from rivers through providing storage or reducing volume of water the river receives. Important: only takes effect downstream of intervention! Benefits are not likely to be felt locally. Indicates potential to regulate local air temperatures and store/sequester carbon.